A little while back I saw an article—somewhere. I recall it being about a condition called ‘highly sensitive person’. My gut reaction was—“an article about whiners? I don’t think so.” I never did actually read it. Recently, however, in one of my self-reflective—what the hell is wrong with me moments I let the concept seep back into my consciousness. Perhaps it was because of uncontrollable crying while watching TV. Maybe it was the NEED to change the radio station during a “phone tap”- AKA prank, that caused me horrible anxiety. It could have been one of those television shows like America’s Funniest Home Video’s–even THAT can make me uncomfortable. Though honestly, it very well could have been the overwhelming empathy that I have never been able to begin to explain. Everyone knows I hate crowds—A LOT. Most people know I like to have very minimal lighting at home. I often watch TV with the sound extremely low or with headphones on so I can just turn it down or off and have complete silence. I sometimes just turn the sound off and READ the closed captions. I am completely incapable of watching commercials for sick children or abused animals. I MEAN INCAPABLE. I cry at happy events just as emotionally as I do at sad ones. I NEED to have scented candles to calm myself. The list of my secret weirdness is long and I have been this way for so long that I contributed it to everything from my being born a Cancer—and we are sensitive, to believing it could be depression that might have lingered… for geez… decades? A couple of weeks ago, thinking that perhaps it wasn’t just the holidays that had me crying at Christmas shows, or commercials, I decided to spend a little time Googling whether this is depression or something else. I honestly didn’t think I was sad. Perhaps I am just going mad! To most people, no one would ever even notice these things about me. I am funny, outgoing, friendly and engaging. One would think that a “highly sensitive person” would be an introvert. I am NOT. I needed to understand what this “highly sensitive person” condition really is. I was excited to think I was getting closer to some sort of authoritative explanation for how I have always felt. I was not looking for a ‘cure’, though being able to watch a movie around people without balling my eyes out, certainly would be be a bonus. This is what I learned. First and foremost I am NOT alone. Whether or not people understand or admit this newly recognized condition somehow didn’t matter to me because I have read the studies and they speak to me… In fact they scream to me to the point—you guessed it—I cried. It is not a condition that describes a personality type. Being a “HSP” is defined has having a hypersensitive nervous system. This would—in my case—explain my sensitivity to light, to sound, to extreme temperature and even smells! Dr. Ted Zeff, a psychologist and author of The Highly Sensitive Person’s Survival Guide, believes that HSP’s do best in nurturing environments. They are more likely to be artists, musicians, teachers, counselors and health practitioners. And, they’re likely to be popular because they’re so in tune with the needs of others. I wouldn’t say I am popular, but I do feel as if my empathy makes me a special kind of friend, even to people I might only come in contact with briefly. From the outside, looking in, the majority of the world would have a hard time believing the sheer amount of tears I shed for an equal amount of happy and sad events. In fact, since I am so hyper aware of my crying at the sad, I try to avoid it, which of course has changed nothing. I cry at every happy ending in a movie, at all ‘feel good’ stories on the news, the interview with the hero kitten rescuer, the lottery winner and just now on Fox and Friends Weekend—the interview with the woman who adopted a blind, 14 year old dog who had lived on the streets—YEP, balled at how loved that doggie must feel. I have often felt the anxiety of loving to dance, loving music but having a complete meltdown in a dance club, where my only solace is a few minutes in the restroom or walking outside with the smokers just to be able to calm myself. These are overwhelming emotions. I feel other peoples emotional pain, sadness and stresses. I am attuned to worldwide tragedy’s more than I understand. It is an amazingly intense kind of empathy, that I have often wished I didn’t have. Other times I am happy I feel strongly when I encounter people that seem not to feel at all. The studies and articles I have been reading, explain this in a way that I have begun to be less hard on myself for what I perceived as weaknesses or flaws. I have long ago learned to cope with my feelings, if only to try and mask them to the masses. But, it is what it is. And apparently, it IS a condition. I admit that helps. The article I read—Here, in The Telegraph—has helped me to understand why I love the quiet, and the dimly lit, the smell of lemon verbena to calm me, or even my love of children’s movies, where they rarely make people feel badly and always have a happy ending. This condition explains why I was never able to watch those early episodes each season of American Idol, where people were so incredibly horrible—I literally can NOT watch people do that to themselves. Don’t laugh, I cringe!, and if I didn’t change the channel I felt physical anxiety. I am hoping that people who wonder why some of us just “FEEL” more, will realize it actually IS a nervous system condition. I put on the ‘tough girl’ persona as my mask. But being sensitive is just who I am, not something to be controlled, because it can’t be. To me, I feel as if it is no different than a sneeze. I can no more control these feelings as I could squash my sneezes. So if you see me sniffling while reading a book, or wonder where I went at the concert or why I can not stand Times Square… Know that I am just your Highly Sensitive Person—friend. Thanks for understanding. Take the Highly Sensitive Person Test, here! How long have I been meandering through this market? I look down into my grocery basket. I look up at the sign at the checkout line I’m in. “10 items or less.” Do I have more? Oh crap, I might have more. Grammatically speaking, less refers to singular mass nouns – a general term, as fewer refers to actual items you can count. 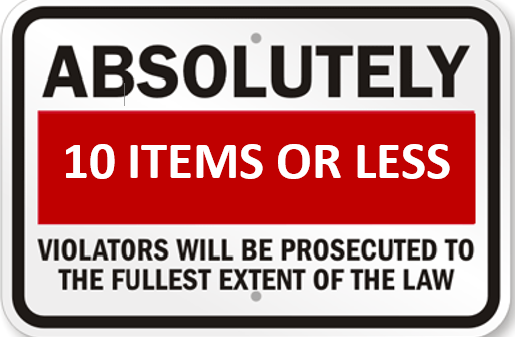 So, am I going to hold this grammatically incorrect sign to mean that “less” means I don’t need to count my items? Hmm. Were it to say 10 items or “fewer”, and someone actually counted my items, would I have a serious problem? Hmm. No. I am, in fact, okay with them using ‘less’ instead of ‘fewer’. It does not roll off my tongue to say ’10 items or fewer’. Besides, there are only 3 lines open. The other two lanes have people who are shopping for some apocalyptic party or have some disorder akin to OCD–where they absolutely must buy insane quantities of whatever’s on sale. Whatever the case may be, here I stand, in an increasingly long line of people holding baskets of, or just holding, “10 items or less”. I start counting. Are four of the same item, ONE or FOUR? A quandary I find myself in too often. You’d think I would ask someone. The cashier has a void. Perfect. Now, a man, carrying a basket in one hand, and a single item in his other walks up to me. “Ma’am, I only have the three items and I’m really in a hurry. Do you mind if I cut in front of you?” Well, I have already been here for a while, and I am now sweating the number of items I have, and whether I will be caught by the “market police”. “Well, I think I have more than the 10 items, so…” He looks at me as if I had more than 10 heads and he clearly doesn’t care, so I oblige. Now, there is one person, being rung up, one person with their seven items on the conveyor belt—I counted, no doubles—and Mr. ‘I’m in hurry’ in front of me. I’m someone who makes up stories about people in line at the market based on their purchases. It’s fun and it’s something to do while you wait. I do this because when I had a cat, and would get off the train late from work, I would stop by the market on my way home. I am pretty sure I was being judged when I plopped down a rotisserie chicken, 6 cans of cat food, a packet of cat treats, frozen brussels sprouts and a pint of ice cream. Yes, that little array screams sad, single woman, with cats… I know. I could hear the silent pity. Now it is I who wield the title of Judgy McJudgerson. Let’s see. The person now being rung-up has a very large container of greek yogurt, toilet paper, pretzels, soy milk, organic eggs, tampons and the current issue of US magazine. That, my friends, sounds like a party! Actually, I am betting single woman, no date on this Friday night. I could be wrong. It’s actually not as easy to ‘read’ people in the express lane. The big cart filled to the brim is where the fun is at. You can tell if they have children or pets, or both. You can tell which they love more. 😉 You can tell if they are entertaining, or having a barbecue. You can tell if they like odd foods, and then you wonder if you should try them. I imagine as often as I am in my market, that my regular cashiers can likely spin quite the tale about me based on the weird and nonsensical cravings I accommodate. Oh well, I will not be deterred. Have a great day, grocery shoppers! You’re sitting at work and smiling… Is this a dream? There are many studies that find a connection between psychological and physical well-being. In other words, Happiness = Healthiness. So, if this is a prevalent theme in society, then the workplace mantra of “a happy employee is a productive employee” should hold similar credibility. The ‘happy employee’ practices of very successful companies has become increasingly newsworthy and noteworthy. The most fascinating to me is the 52 and 17 rule. Working in sprint like fervor for 52 minutes and then mind clearing breaks of 17 minutes, produces the employees with the highest productivity ratings. Before I even knew this was a thing, I would try this. Perhaps telling a story to my department. 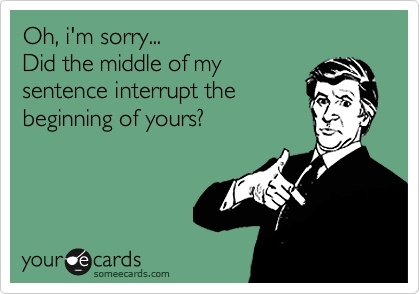 But a little levity was met with the look of “WHY THE HELL AREN’T YOU AT YOUR DESK?” My morale was sky-high–[eye-roll]. Alas, I found myself in the dark ages of low morale. How, exactly, is “if you’re unhappy, you can always leave here. No one is making you stay”, a productive statement to employees? I find myself to be a different kind of manager. One whose methods include teamwork, recognizing hard work, encouraging idea sharing, attentive, (caring about employees as people—friends). We spend so much time at work, it is—I believe—imperative to constantly strive to have everyone HAPPY to be there. I mean, we work for the same company. I enjoy working towards the same goals and sharing in the success stories. As a manager, applauding those who work hard and building up everyone to share in the “fun’, is inspiring for myself as well as the group. Most of us know the stories of the “really cool” companies to work for. We’ve seen the stories of company excursions to fabulous places. However, not every small company can go to lengths like Top 10 Forbes companies. http://www.forbes.com/pictures/efkk45jkjf/top-10-companies-doing-the-most-to-make-their-employees-happier/ But there is definitely room for improvement for some. The jobs site CareerBliss.com has the Leap Awards, honoring the companies that have made the biggest strides to improve employee happiness year-over-year. This is an impressive award. CareerBliss evaluates more than 250,000 company reviews and ratings it receives from employees nationwide to find the top 50 deserving companies. To qualify for the list, each company has to have at least 50 reviews. If you look at the list and do some quick math, you will come to the same conclusion as I did. Happy employees make for prosperous companies. Time. How do you put a price tag on time? No one has enough of it, and generally speaking, if you want to take time off from work—at least where I was, with a Scrooge school of business mentality—it was frowned upon. I would like to take a page from the likes of Moz—a software marketing development company that has a GREAT time perk. All employees get 21 days paid vacation AND the company gives them a bonus $3000 in vacation reimbursement for food, lodging, entertainment and transportation. The CEO at Moz believes that this type of perk is essential to keeping amazing people on his team. Right THERE is part of the morale booster. The CEO recognizes that he HAS a great team. Other companies like Netflix have instituted unlimited vacation days—which has its problems as well as its benefits. Not everyone is equipped to hash out how many days is right for your job. Will you feel pressure for taking more or less days than your peers? All in all, though, I personally would like that kind of conundrum. Food. Food is always welcome. Many companies will offer a pizza day or doughnut day, where more health conscious companies might offer something more on par with their healthier lifestyle, and everyone loves a little gourmet feast we won’t make for ourselves. Food is a fabulous perk. Food offerings, since the first caveman brought a Mammoth gift to his cave neighbor, has always been a great gesture. their work for an hour to go on an organized run around the neighborhood. This clears minds, provides a mental break, increases camaraderie and is super healthy. A more prevalent company fitness perk is simply paying for or subsidizing gym memberships or classes. And an up and coming perk is having a gym on the premises for employees to use. Again, seemingly a no-brainer to increase morale. These are just some perks that companies who value their employees use to keep them happy. Low morale can simply not be dismissed. A very interesting survey by Watson Wyatt and World at Work, found that from 2009 to 2010 the percentage of top performing employees that would recommend their employer to others for a job dropped by nearly 20%. Even more telling was that slightly more than 40% felt their pay and benefits changes over the past year had had a negative effect on work quality and customer service. These are the types of costs to a company that, if overlooked, will be more than most employers can bear. The moral of this morale story is simple. You reward your employees with a few perks and some recognition for their work and you are, in turn, rewarded right back with loyalty, hard work and great press. Word of mouth for any sized company is priceless. Better it be good press than bad. 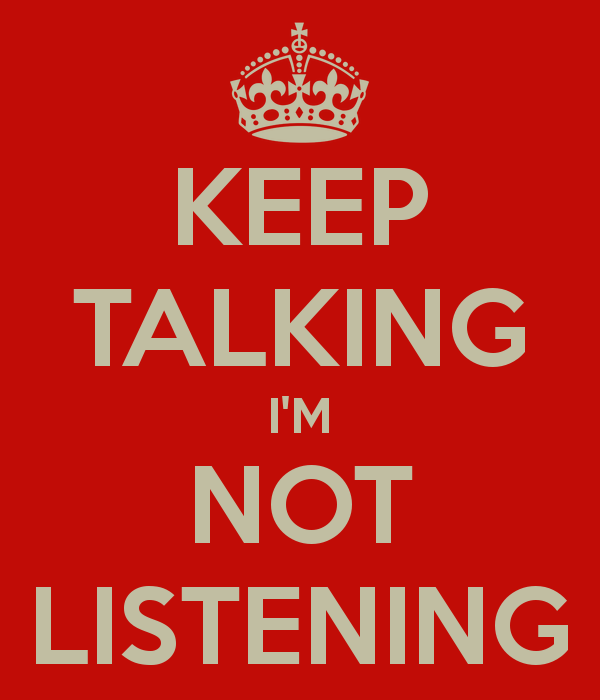 Are you listening or just waiting to talk?! Dialogue: (verb) take part in a conversation or discussion to resolve a problem. There is a great divide. It is People. Open discussions with people involving hearing AND listening used to be part of my everyday life. 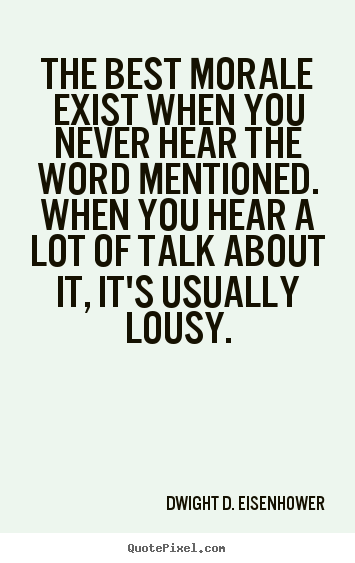 Nowadays, well, there is plenty of talk, and not much listening. People don’t seem to waver from their stance on ANY subject. From the practical and sometimes enjoyable can of Beefaroni—see!!! You are already judging—to healthcare, listening to someone say their piece has vanished and been replaced with preparing a verbal assault. I am the first to admit I have many, I mean MANY opinions. In fact, there is probably very little I don’t have an opinion on. I am lucky or smart enough to surround myself with people I enjoy having a healthy banter with. And, this is what I love about my family and friends–we hash things out. I look forward to my niece’s take on things that I have clearly not taken into consideration or my brother correcting me because he just so happens to have more information than I am privy to. It may not completely change where I stand, but I can tell you I always take pause. I was recently verbally assaulted by a person whose opinions seemed scripted. Genuinely, as if he had some sort of—don’t take this the wrong way—Liberal handbook. He had way too many facts askew, so I asked where he got his information. A question I felt was valid, and in this case—NECESSARY. My crime for the ensuing onslaught was fessing up to being a fiscal conservative. And in response to my seemingly simple question… there was silence. I asked again. I figured I would help him out. I mentioned I have the Pulse app on my phone and follow 12 News apps and 6 Political apps, encompassing a variety of viewpoints. I mentioned that I generally like to check things out on Politifact or Factcheck.org and even hit up Snopes occasionally. So I waited patiently for some sort of a response. The response was that I must be some sort of “Ann Coulter wannabe”. I was trying to imagine anything I would find more personally offensive… and at that moment, I couldn’t. And just when I thought I was going to walk away….. which I promise you, I really was, I decided to say the defusing sentence. I said, “Sometimes, with some issues, it is best to agree to disagree”. I took the high road—not a well-travelled path for me. THEN, the unthinkable happened. He KEPT TALKING!!!??? Compared me to Rush Limaugh, Bill O’Reilly, Hannity—He talked about my not KNOWING that we live in an oligarchy, that we are (insert really bad word here), because we can only choose between Pepsi and Coca Cola, and that corporations have bought all the politicians and our votes don’t count…that until there is a revolution and “we take our government back from the 1%” we are all… yes, insert that same bad word. Well…. What was I to do? There was nothing on earth I could say to him, and he had not yet given me any idea where and how he formed his opinions. Even if I wanted to agree with any part of his tirade, I was pretty sure I was still about to get burned at the stake for being a Republican. I was curious… I don’t even know this guy, but was demonized as a right-wing fanatic, who as far as he was concerned, was on the side of the super wealthy. Funny… I don’t make that much money, but what I do, I work hard to keep. This started with a few simple statements. I said I consider myself a fiscal conservative, I have a blog page and I sometimes might write about things of a political nature. Big mistake—HUGE. But this isn’t about one closed-minded, misinformed person. It was about his simply not working with me on what we disagreed about. Where is the dialogue? It is monologue after monologue. I was used to this in the actual political arena, but in what should have been a “get to know ya” conversation? It became hostile. Okay, maybe I became hostile. But every BUTTON I have was pressed. It was as if some kid got on the elevator of a 30 story building and pressed every single floor! Perhaps I am not as ‘open minded’ as I hoped, or thought, or wished. But dialogue certainly involves 2 voices. Evolution of said dialogue involves both those voices listening to the other. Lack of dialogue very well may be the cause of an ever soaring divorce rate, but that dialogue is clearly for another time. “It is partly true too, but it isn’t all true. People always think something is all true”—J.D. Salinger, The Catcher in the Rye. This lack of dialogue is of epidemic proportions. It reaches far beyond politics. People have become so sure of their own voice and their own opinions that a chat about a movie or TV show or a song can turn ugly pretty fast. GEEZ, people—lighten the heck up! Perhaps we all have some growing we can do, open our minds, evolve a little! We do not live in a world of absolutes–Just ask any scientist. So it is in everyone’s best interest to listen, process and THINK… for ourselves. Problem: People are closed minded, unwavering, and more often than not—ill informed. Solution: Beats the heck out of me, but I am open… yes I AM OPEN … to suggestions. I have tried the high road, driven many a mile on the low road, and have hid in the bushes to avoid the road and its traps altogether. As the United Nations General Assembly is in session a few blocks away, I wonder what kind of dialogue is going on there. Is anyone listening? Or, are they just preparing their verbal, tactical assault?